We reviewed Twitcasting here. 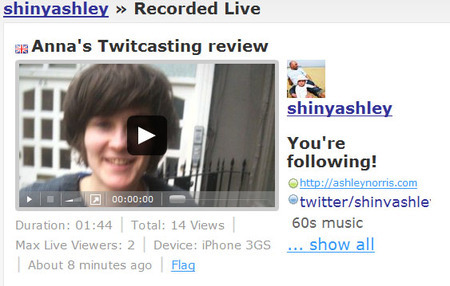 Then we did a meta-review of Twitcasting on Twitcasting: watch it on Ashley’s account here. Cons: that iPhone camera isn’t amazing, pictures are jerky and the sound isn’t audible at some points. It works best when you’re right next to the camera and that looks a bit weird. -can’t embed the video elsewhere.